These protests did not oust the government of Peña Nieto, although they demanded the resignation of the president, but they did force the government to react and try to explain what had happened. 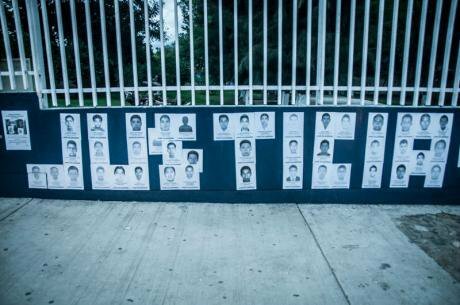 Posters with the faces of the 43 students disappeared in Ayotzinapa. Demotix/Alberto-Sibaja Ramirez. All rights reserved. Eight months ago, on September 26, 2014, six young peoples were assassinated and 43 disappeared after having being arrested by the police of the Mexican City Iguala and given over to drug cartels. Eight months later, the 43 students of the Escuela Normal Rural of Ayotzinapa are still missing. Their story has shown the extension of violence and collusion between the drug cartels and politics in Mexico. On the eve of September 24, 2014, Mexico, a country that has experienced terrible events in the last eight years since the government of Felipe Calderón launched a direct “war against drugs”, lived through an event that went far beyond anything previous, one that has been compared to the atrocities of the Islamic State or Boko Haram for the sheer cruelty and cold blood of the perpetrators. The police of the third largest city of the State of Guerrero, Iguala (around 120,000 inhabitants), one of the poorest, most violent, most polarized, terroir of radical movements, scenario of guerrilla warfare and a “dirty war” led by military forces in the sixties and seventies, attacked a group of around 100 students in a teacher training college in Ayotzinapa (one of the poorest regions of the State) that had come to confiscate (as they regularly do) a couple of buses in order to go to Mexico city to participate in the celebrations of the October 2, 1968 manifestations. The police killed 6 students and abducted 43 others, delivering them to a local drug gang, led by the mayor’s wife, who (according to the official version) killed them in cold blood and burned their corpses in a garbage dump outside the city. This terrible event aroused a wave of indignation against the government, both local and national, and a flood of sympathy for the students and their families, as well as a demand that the government investigate and discover the truth of the events and prosecute and punish all those involved. The governor had to resign after two months of prevarication, the mayor of Iguala and his wife are accused of complicity, dozens of policemen are in jail awaiting trial, and the strategy of the federal government to stop setting violence and the war against drugs as its priority, unlike that of the previous government, collapsed in the face of this tragic event and its incapacity to respond seriously to such an unprecedented trauma. Having described the facts and some of their political consequences, in this short piece I intend firstly to set side by side the different interpretations of the causes of this event and then to discuss what the reaction of the population predicts for the future of Mexican society and politics. There are two distinct interpretations of what happened in Iguala. On the one hand, there is the interpretation of those who have tried to understand the relationship between the local authorities, population and drug cartels that arose after the “war against drugs”. According to this interpretation, this event, like others occurring in many other regions of Mexico: Chihuahua, Veracruz, Tamaulipas, Sinaloa, is part of the drug lords’ advance plan to control a territory rather than, as in the past, controlling the routes to the United States. In this strategy, the drug cartels attack other criminal gangs, the army and the police forces they do not command and terrorize the population by the use of these types of massacres. They command local police forces and political authorities, through fear or corruption, and impose their absolute dominance over a territory in order to be free to plant and transport drugs without any opposition or risk of denunciation. The feudalization of the political system in Mexico, as one of the consequences of electoral reform within a weak civil society, has led to this situation whereby sovereignty does not depend on elected officials, but on criminal gangs. This may well describe the situation of certain regions in the north of the country, such as parts of Chihuahua, Tamaulipas, Veracruz, and it is in effect one of the situations Mexico is living through at the present time, but it is not exclusive. There is another situation, currently characterizing a region such as Guerrero, where this territorial war between drug lords merges with a more “traditional” situation, best analyzed by anthropologists. And the story they describe is rather of a “continuum” of violence exerted by local government forces, the ever-present army (since the guerrilla wars), the local “caciques” and the paramilitary forces, to which we currently have to add the drug cartels. Violence in Guerrero has been always exerted against social activists, journalists, and opposition politicians. A student interviewed by Margarita Mora considers that in the present round of repression, the drug cartels have merely substituted the paramilitary forces financed and controlled by the landlords. His idea is that what exists in Guerrero is a Drug-State: “They take away our lands, destroy what we own, then try to hire us as low wage labor for the sowing of poppy, to then accuse us of being criminals. We are squeezed between those two choices, with no honorable options”. We could add to this picture not only that the peasants are being robbed of their land but that, more recently, since the neoliberal turn taken by the Mexican economy and the latest educational reform, most rural schools have closed down and the rural teachers’colleges, such as the one of Ayotzinapa, are doomed to disappear. These terrible events caused a tremor in Mexico’s conscience and provoked an ethical awakening, at least among the young. They provoked an outcry from that part of Mexican society that is deeply moved by the fate of some of the poorest inhabitants of this country, young people who had elected to take the decent route in life, that of a school teacher, instead of becoming guerrillas or drug hit-men. This was bound to strike the younger generation more forcefully. Thus, it was the young who organized active strikes, discussion groups, and sit-ins in dozens of universities all over the country and in other parts of the world, where the situation of the country was clearly depicted, especially concerning violence, the perspectives for up and coming generations, the future for political parties. It was also the young that organized the three massive manifestations in Mexico City and other capitals of the country that followed hotfoot one from the other, from September to December 2014; a mobilization that the country had not experienced since the manifestations of 1968, which ended tragically. They also eventually led to the resignation of the governor of Guerrero and of the prosecutor of the Republic. Apart from the demand that the government find the students alive, the other most frequent slogan that was heard on these marches was the cry that the culprit “was the State”. This meant that the perpetrators were not only the drug cartels and the local government as the Government pretended, but the federal State that had allowed the situation of impunity that permeates the whole country, where deaths are counted but never investigated, the disappeared are never found, where there is nobody accused or found guilty, where a handful of criminals end up on trial and even fewer in jail. A government that had sent the military to fight the drug cartels with the resulting rapid increase in human rights violations. It was also the State that was responsible because it has been eliminating the rural schools and its teachers – people who had turned out to be just too radical. Most marked of all were the young Mexicans that organized the movement #YoSoy132 in 2014 against the manipulation of the media in favor of the return of the PRI to the presidency. Like other youngsters in other parts of the world, they were struck by the realization that they would inherit a world that is increasingly unequal, polluted and unsustainable. Mexican youth went to the streets to denounce the fact that Ayotzinapa only another of those acts of violence, albeit one of the cruelest, which the Mexican State, directly or indirectly, perpetrates against its young. Since the sixties, the government has made it clear just how much it fears its own youthful population. It killed hundreds of students in 1968, an unknown number in 1971. It prohibited festive manifestations such as the Mexican Woodstock (Avandaro) once it realized that these gave birth to an energy the authoritarian PRI government of the time could not control. Although nothing seems to have changed with the manifestations for Ayotzinapa, many youngsters protested in public for the first time in their lives, and gained an awareness of the terrible situation in which the country finds itself, so different from the official picture. This is why one can affirm that the Massacre of Ayotzinapa has marked a date in the modern history of Mexico. There is a clear sense, shared by many young people, that Ayotzinapa draws a line that creates a before and an after in Mexican modern history. And that although the capacity for action has receded for now, something remains in the consciousness of those hundreds of thousands who participated. Even if they were not able to change the government or the country as they would have wished, they have transformed themselves. Their tolerance of injustice has been irreversibly diminished. Interview in Mora, Mariana, “Ayotzinapa, violencia y el sentido del agravio colectivo: reflexiones para el trabajo antropológico”, Ichan Tecolotl, no. 293, january 2015. Hernández Castillo, R.A., “Violencia y militarización en Guerrero: antecedentes de Ayotzinapa”, Ichan Tecolotl, no. 293, january 2015. The Partido Revolucionario Institucional (PRI) created on the wake of the Mexican revolution, that governed under different names from 1929 to the year 2000.